Spinach Salad, may not sound like the most exciting recipe in the world. But what if I add in words like bacon, bacon vinaigrette, apple, feta? Becomes a bit more tantalizing doesn't it? This spinach salad is one of my favorites for a starter course, or as a side salad for say a big summer BBQ. It's easy to make, the favors work great together, and it looks beautiful. Give it a try and let me know what you think! Add about half the dressing, and gently toss the salad. Taste. If needed add more dressing, and toss again, repeating until you're happy with the result. 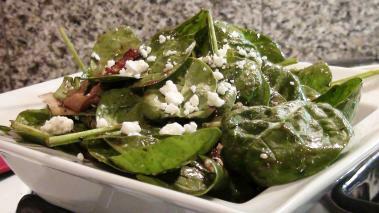 If you having this spinach salad as a stand alone dish, I'd suggest a light, refreshing wine. Champagne, or sparking wine would be great. As would a Riesling, which are low in alcohol, but have good affinity with foods like salads. Hope you enjoy it!